Many gardeners apply lime to lawns and gardens as part of their regular maintenance plan. Lime can have a beneficial impact on turf and garden plants, but it affects more than what is seen above ground. Many bees nest underground and can come in contact with lime products applied to soil. When applying lime, choose the least toxic options, and keep bees and other beneficial insects in mind. Gardeners use lime to raise soil pH. Lime acts to reduce soil acidity and increase alkalinity. When soils become acidic, primary plant nutrients, such as nitrogen, phosphorus and potassium, become less available to plants. Even alkaline soils can become acid over time due to fertilizer use and nutrient leaching from watering and rain. With moderate alkalinity increases, macronutrients become more easily absorbed by plants. If soil becomes too alkaline, however, nutrient availability is reduced. Many people have heard about decreases in honeybee populations, but the challenges to native bees seem less widely known. Native bees are highly effective and efficient pollinators. 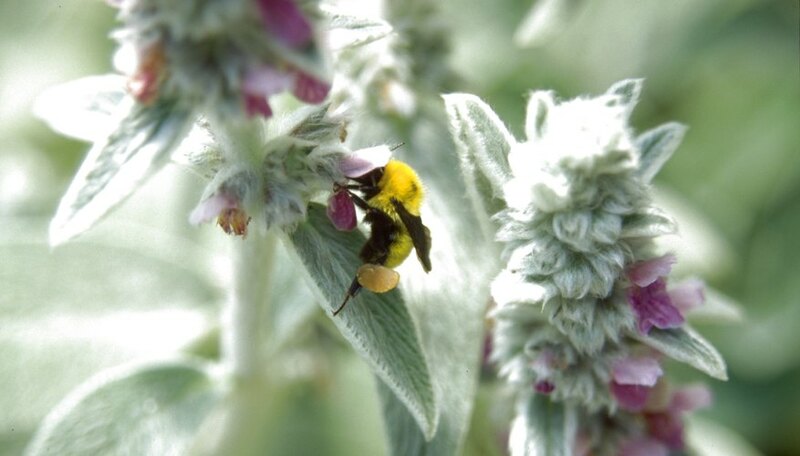 According to the U.S. Department of Agriculture Forest Service and the Pollinator Partnership, native bees pollinate 80 percent of flowering plants. Unlike honeybees, which live in hives above the ground, 70 percent of native bees live underground. Many native bees are comparatively very small. Smaller quantities of soil chemicals would potentially affect them to greater degrees. All limes are not created equal. Gardeners apply the term to several different products. The least toxic ones are derived from natural ground limestone. These include ground limestone, calcic limestone and dolomitic limestone. Different limestone types produce calcium carbonate and magnesium carbonate blends. These non-caustic, ground-stone products are not considered hazardous. However, burnt, or quick, lime and hydrated, or slaked, lime are quick-acting, hazardous chemicals that can burn human tissue. Err on the side of caution for yourself and your pollinators by assuming that these caustic chemicals could injure or kill bees. If you choose to lime, minimize the impact on bees and other beneficial insects, by targeting your application carefully. Avoid areas where bees nest. Ground-dwelling bees prefer sandy, bare soil, free from mulch and grass. Use lime only when a current soil test confirms a need, and follow recommendations carefully. Never exceed a rate of 50 pounds of ground limestone for 1,000 square feet. Always wear gloves and protective clothing and eyewear, and keep a vigilant eye open for pollinator friends.